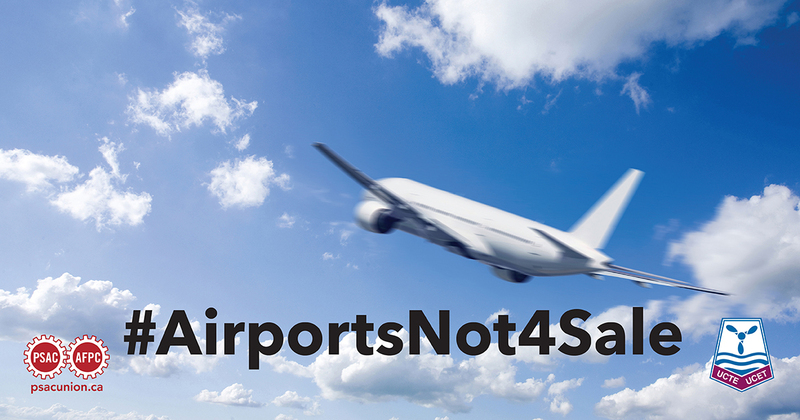 Tell Prime Minister Trudeau: Don’t sell our airports! Airport privatization is still on the table. Statements from the Prime Minister and Minister of Finance have been inconclusive -- the government continues to pay private consultants to look into the possibility of airport sales and the amount of revenue they could generate. Airport privatization could be in the scope of the newly created Canada Infrastructure Bank. In fact, the Prime Minister recently appointed James Cherry to the Bank’s Board of Directors. Mr. Cherry is a former president and CEO of Aéroports de Montréal who has advocated for airport privatization in the past. An Angus Reid Institute survey released April 26, 2017 found that 53 per cent of Canadians are against airport privatization and 46 per cent of Canadians are concerned this could worsen their travelling experience. Airports have voiced concerns, including the Ottawa International Airport Authority and the Vancouver International Airport. Airlines have reacted negatively to the idea, voicing concerns that it could increase the cost of air travel. The Vancouver City Council voted to write a letter to the Honourable Marc Garneau, Minister of Transportation, indicating opposition to move towards a private share structure. Calgary Mayor Naheed Nenshi has voiced concerns about the plan to the media. Air travel in Canada is already expensive compared to most other countries and this could make it worse. When airports were privatized in Australia, passenger fees doubled. Unlike a non-profit authority, investors will expect new margins of profit – created either by cutting airport services and staff, or raising prices. Right now, airport authorities incorporate municipal, provincial, and federal representation – airports are critical infrastructure to communities across Canada. That could change after they are ‘profitized’ with communities losing accountability and transparency under for-profit ownership. That’s why cities are speaking out against it. Canada’s non-profit airports pay their own way, sending about $1-billion a year to Ottawa in rent and security fees. This revenue will be lost and with it billions in valuable real estate and infrastructure.